The temperature is still seesawing, but most of the migrating birds have reached us on their usual schedule. 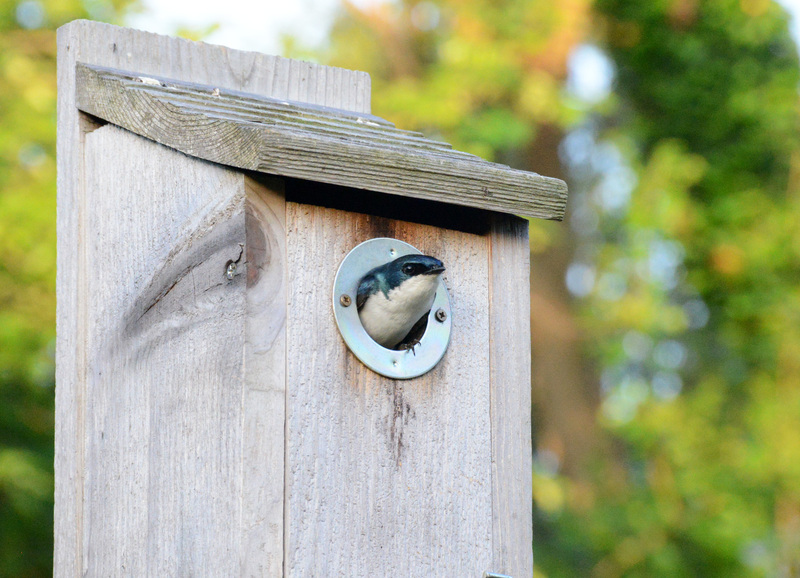 The Tree Swallows (Tachycineta bicolor) have finally settled in one of the bird boxes and have started building their nest despite harassment from the House sparrows. We really have to keep an eye on this one to make sure that the sparrows don’t rout them. The Baltimore Oriole (Icterus galbula) came back as soon as the flowering fruit trees like cherry and pear here blossomed. One of them was waiting patiently at the feeder station for the welcome mat. We promptly cut a few oranges and put them on a tray for them. It didn’t take them long to dive in for the juice, they must be hungry from their long flight. Enjoying the welcome mat of fresh Tangerines which is what we had on hand when they arrived. Gray Catbirds, Rose-breasted Grosbeak and Chipping sparrows are also here. The first two still play hide and seek with us; every time we took the cameras out they flew off. The Chipping Sparrow (Spizella passerina), the smallest sparrow around here, are not camera shy. The Ruby-throated Hummingbird haven’t reached here yet. Only the Bleeding heart flowers have start to bud and the Columbine still have a long way to go. 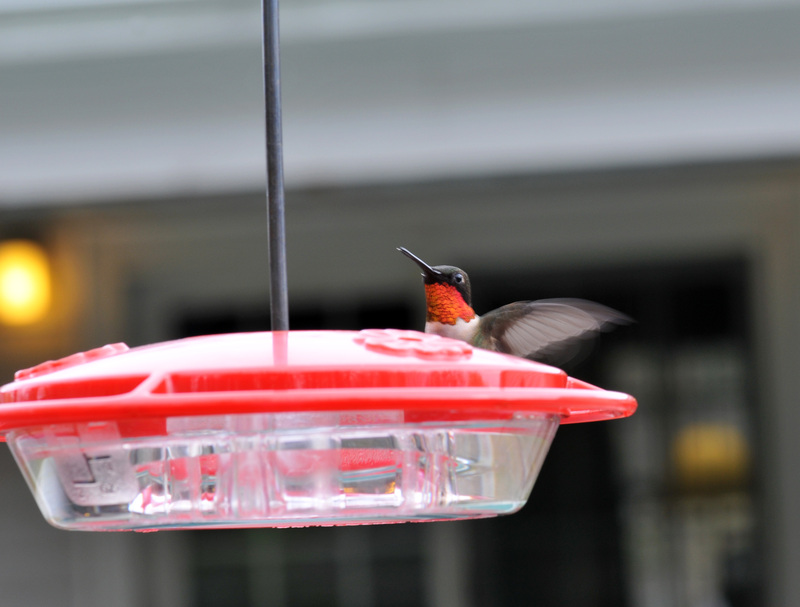 We use the blooming of these flowers as an indication of the arrival of the Hummingbirds. The Columbine is a more reliable reference. 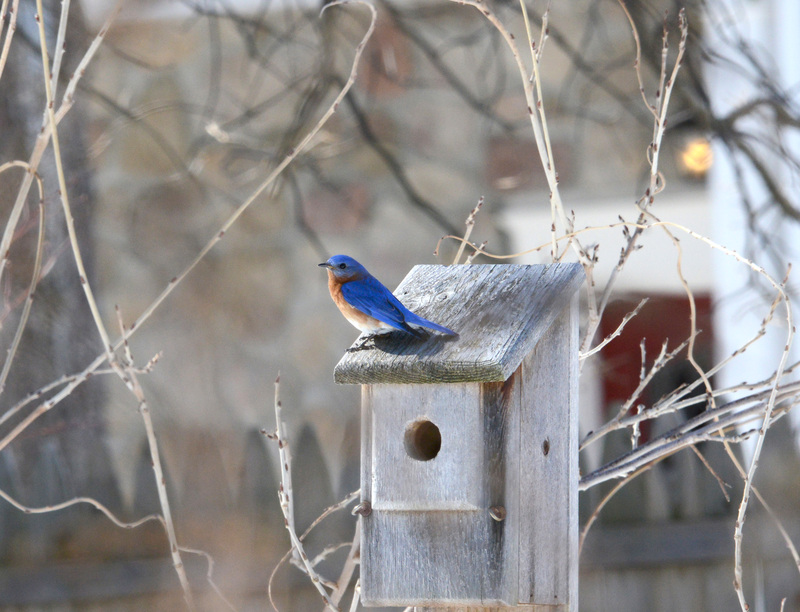 In the mean time, the resident Eastern Bluebirds (Sialia sialis) took no time in starting their family. So far she has laid five eggs and any day now we’ll will see the first chick. Eastern Bluebird family. She’s back with building material. 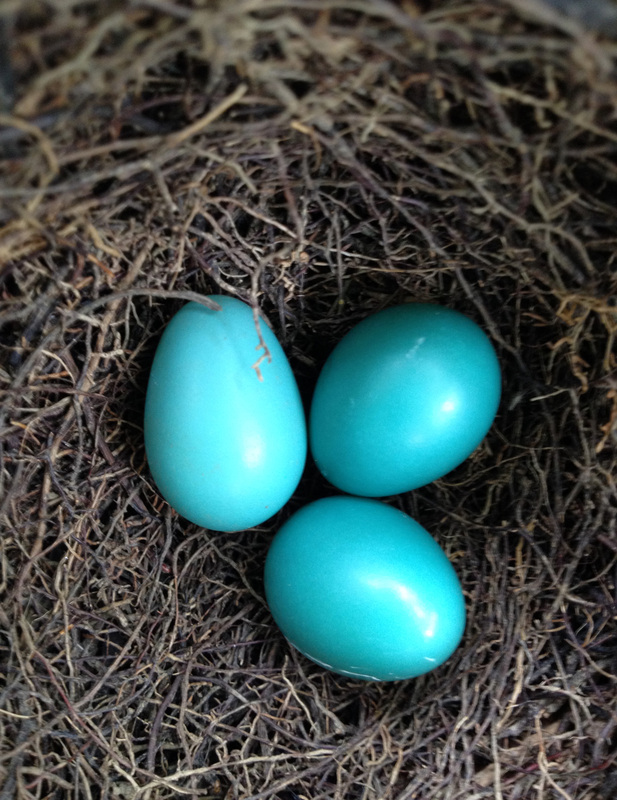 Five beautiful blue eggs of the Bluebird family. The Black-capped Chickadees (Parus atricapillus) have almost completed their nest construction. It looks very comfortable with moss and a fine hair lining. It will be a couple of days before we see the first egg. 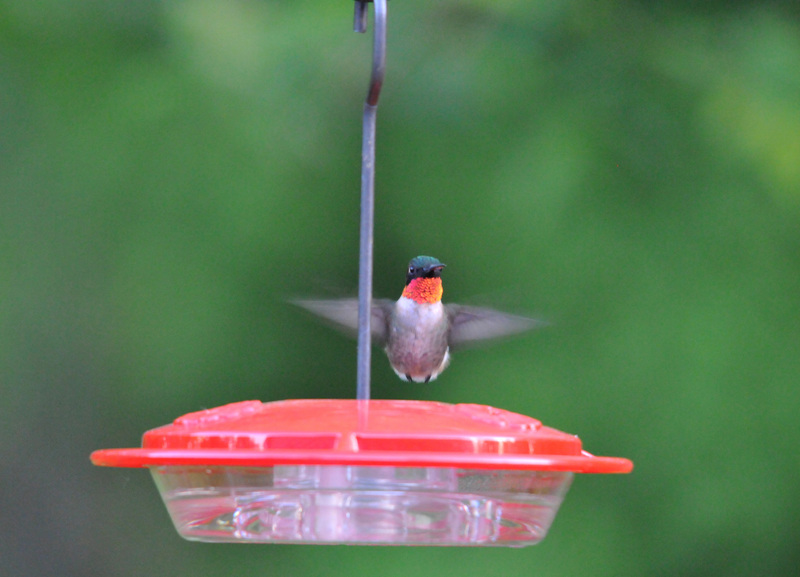 We are only missing the Ruby-throated Hummingbird but they should reach our garden soon. A flight from down south on their tiny wings takes a little longer than the others. 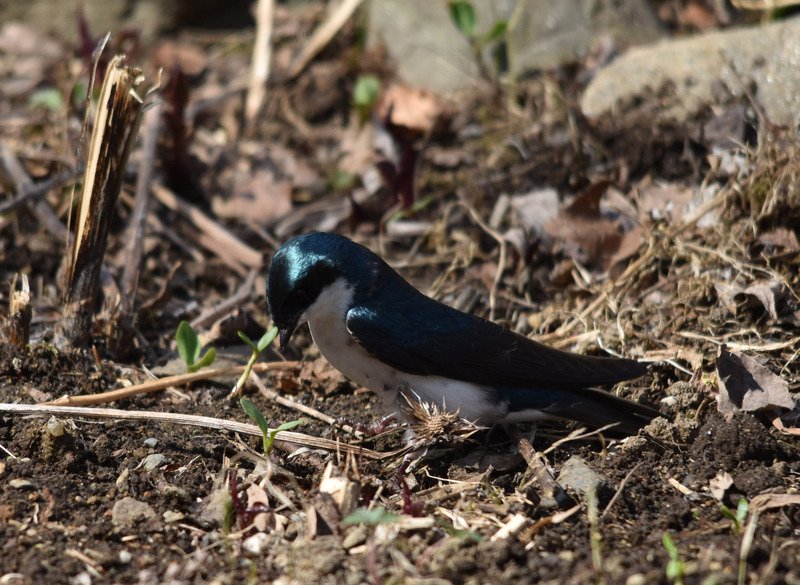 We were glad to see our old friends who flew back from the South, the Tree Swallows (Tachycineta bicolor). It’s fun to watch them chirping while gliding around at high speed. 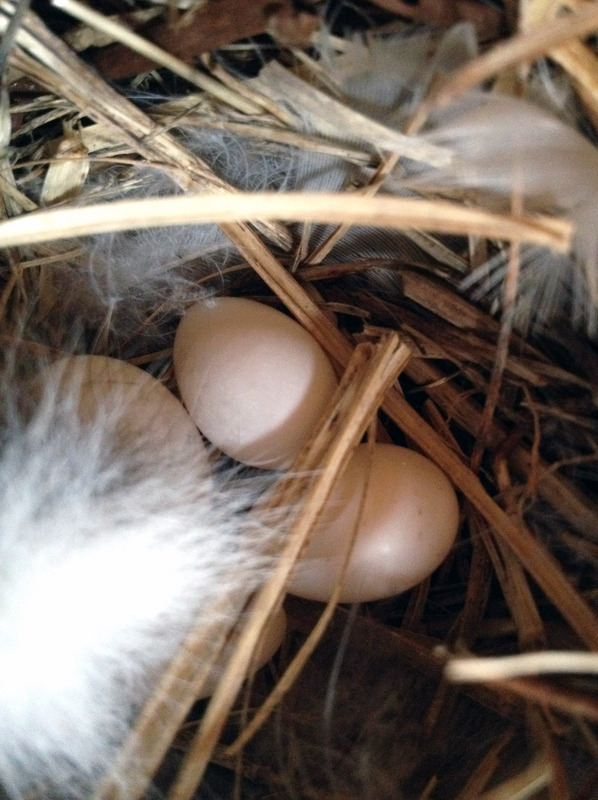 This spring one of their usual nest boxes was taken first by an Eastern Bluebird family (previous post) which had already produced four beautiful eggs. One of the Swallows poked its head in the house to check it out anyway. He was promptly bombarded by the male Bluebird and ended up in a nasty fight on the ground before the Swallow could get away. Both Bluebirds now stand guard not just on their nest box but on one other nest box close by. One pair settled for the box by the vegetable garden. Watching them communicate with one another is quite funny. I wish I could tell if they are the same pair as settled there for the last two years. The Swallows have been nesting in our garden for the past several years and we hosted two broods last year alone so they could be the younger generation that were born here. It doesn’t really matter which pair they are; they are all welcome. 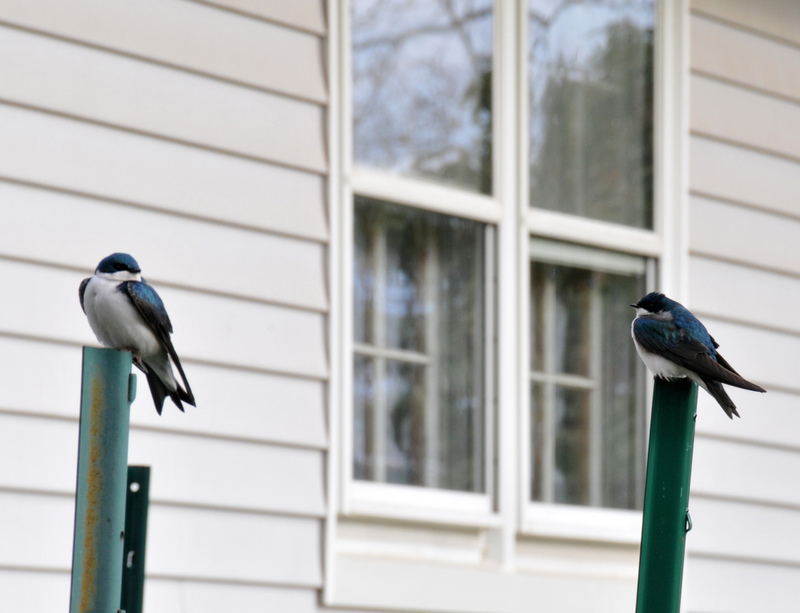 Tree Swallows (Tachycineta bicolor) have been back in the neighborhood for a few weeks. They have been checking nest boxes around the garden but they have been chased out of each nest box they tried by the House Sparrows. In turn, we chased the Sparrows out. It’s a spring ritual that we have to do in order to secure a place for the songbirds. 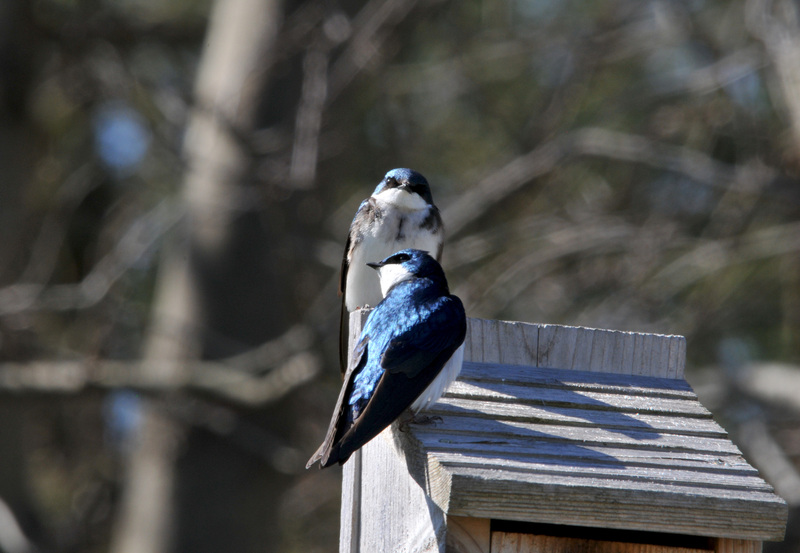 Finally, a pair of Tree Swallows settled into one of the boxes. Hopefully, the other two pairs will not be discouraged by the Sparrows and will find another place to raise their families. We had three Swallow families in our garden last year and they tend to come back to the same place year after year. The female has been building her nest for the last few days. Her mate keeps an eye on the intruder Sparrows. It’s fun to see her selecting nest material and trying to get it into the nest box. It’s a little too long to get it in. Now what? Must be a way to get this stick in. 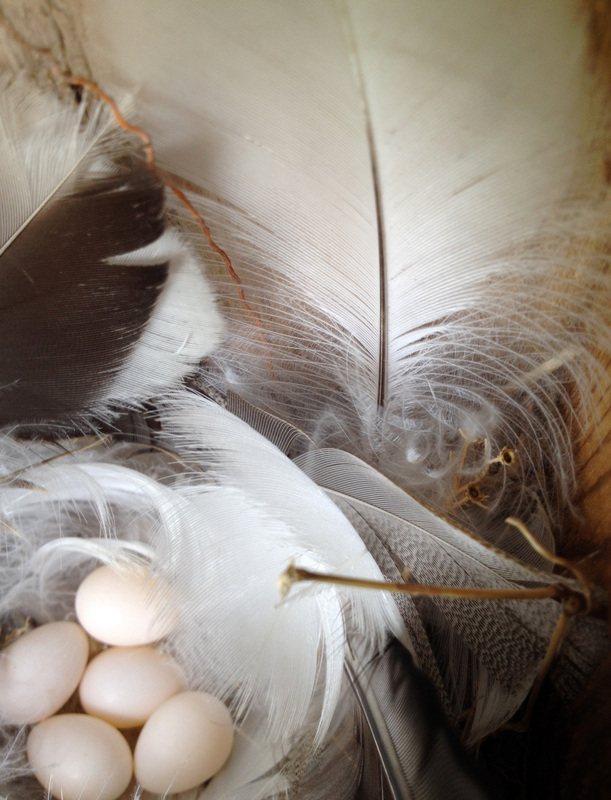 Eggs of the Tree Swallow (Tachycineta bicolor) by the vegetable garden have hatched, all five of them. Mom and dad are busy catching insects for the chicks. They are not bothered by me working in the vegetable garden now. I think they have learned from last year that I didn’t harm their kids so they let me walk near by without dive bombing me like last year. This makes it easier for me to weed and pick vegetables in the garden right underneath the nest. The second Tree Swallow family nesting a mere fifty feet away also have five eggs. This family still gets nervous when I get too close to the nest. She will fly out of the box and perch on a branch above, watching me. When I get too close they take turns dive bombing me. I hope they’ll be friendlier next year. I put a new nest box up in the garden to lure the Bluebirds in for their second brood but it seems like a third Swallow pair wants to nest there instead. We are building up a colony of Tree Swallows here and I don’t mind at all. They are prodigious insect eaters and fun to watch swooping, soaring and gliding in the sky. A surprise family of Gray Catbird (Dumetella carolinensis) is nesting so low in the Rhododendron and very close to the front door railing. They usually nest higher up in the shrubs or in the thickest of the Forsythia. 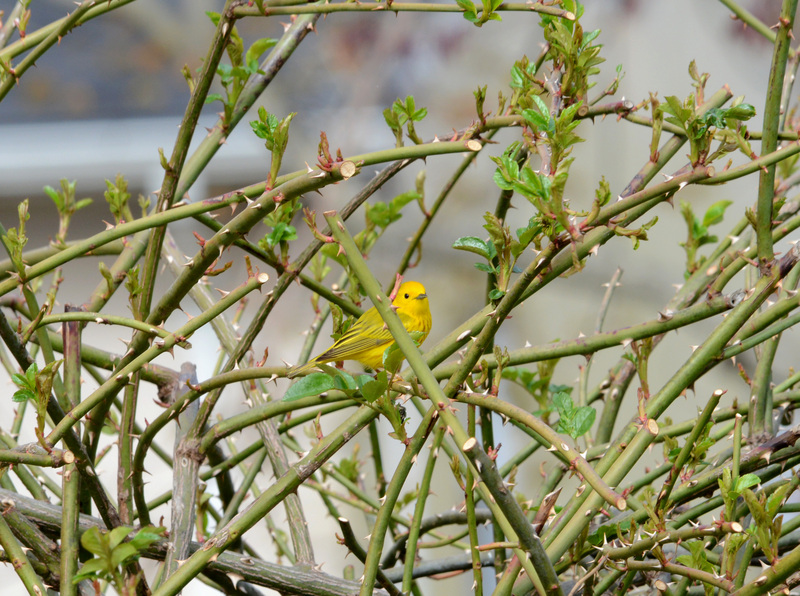 Last year we severely trimmed the forsythia reducing their nesting real estate. There are three turquoise blue eggs in there. I have to leave the front walkway alone until their chicks fledge. At this time of year our garden is busy with a variety of birds singing, courting, building nests and a few have already started to rear their first brood. I have mentioned some in previous posts about our resident Eastern Bluebirds and the migratory birds that come back either to settle in our garden or just passing through. 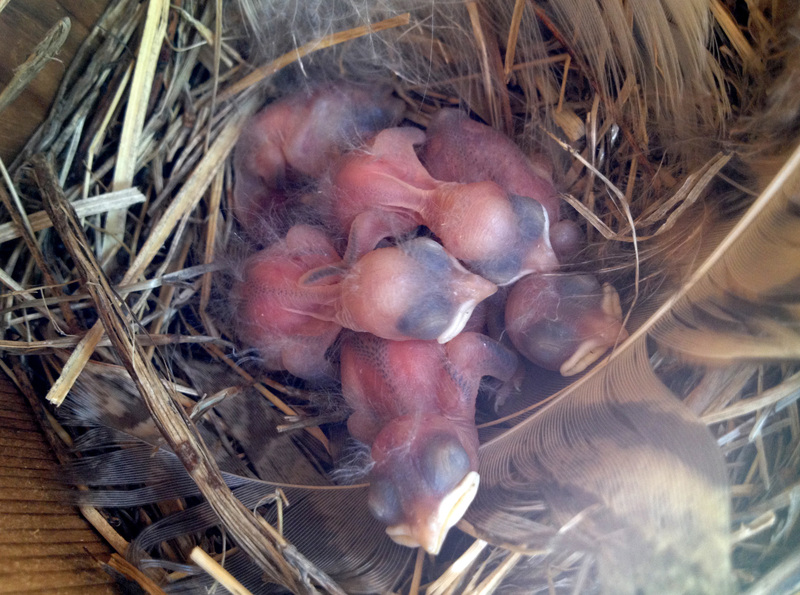 It’s been only a couple of weeks and the Bluebirds have hatched but only three of them. I keep checking on them every 7 to 10 days to make sure that the House Sparrows haven’t raided their nest and killed the chicks. All of them look very healthy now. Mom and Dad make countless trips every day to feed them. 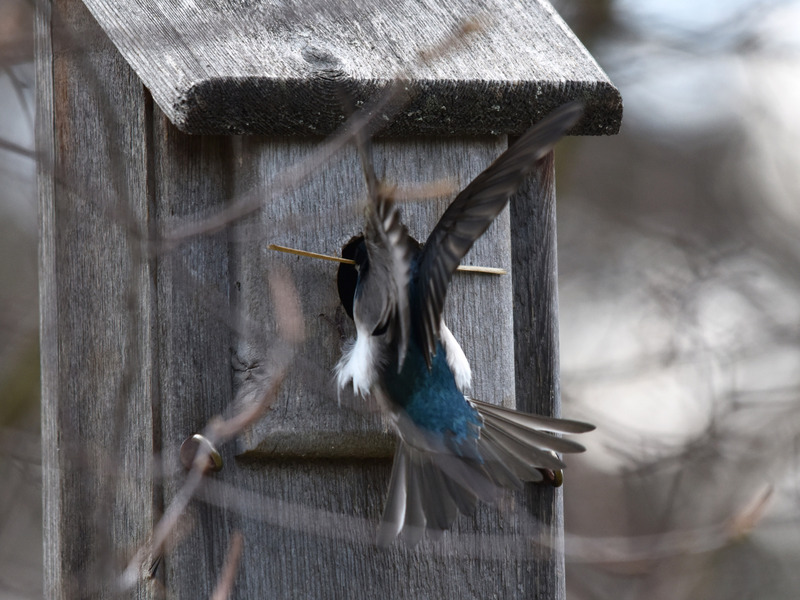 The Tree Swallows that nested in the box by the vegetable garden have finished building their nest, lined with white feathers and down picked from the lake nearby. In less than a week, there are four white eggs laying comfortably in it. The female is so used to me being in the vegetable garden now that she just sticks her head out to look at me when I’m right by the box. If I continue working, even right below her nest, she just disappears back inside. Once in a while she would come out to stretch on top of the pole in front of the nest box. It’s a comfort to have her keeping me company while I’m working. The second Tree Swallow family just starting to build their nest again. They were chased out by a male House Sparrow after they started the first time but I manage to get the Sparrow out. So, they resumed building at the same place. I hope to see four more eggs. It’s always nice to have more insect patrolling in the yard than less. Most of the birds that migrate south during winter have come back. The Tree Swallows (Tachycineta bicolor) came back before everyone else. They swooped around looking for their old houses that I had removed for the winter. They checked out the Bluebirds nest box and were chased off by the occupants. As soon as I put the box back up where it was used by them last year, they took ownership with in minutes. Another pair took one nest box in the front but was harassed relentlessly by the House sparrows. I hope that it doesn’t deter the Swallows from staying with us. The Rose-breasted Grosbeak (Pheucticus ludovicianus) also came back to the feeder. I have seen just the males, no females in sight yet. Chipping Sparrows (Spizella passerine), Gray Catbirds (Dumetella carolinensis), House Wrens (Troglodytes aedon) and Ruby-throated Hummingbirds (Archilochus colubris) are back as well. 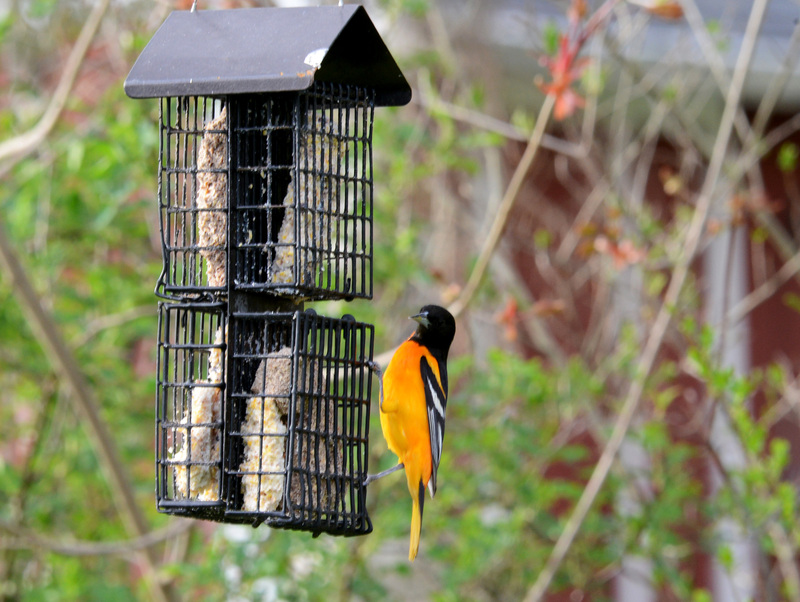 The Baltimore Oriole (Icterus galbula) settled for the suet as many of the fruit trees around here haven’t blossom yet. I haven’t seen the White-crowned Sparrow (Zonotrichia leucophrys), Fox Sparrow (Passerella iliaca) Eastern Towhee (Pipilo erythrophthalmus) yet this year. But the spring is still young and very cold. Hopefully they’ll filter in with the warmth. 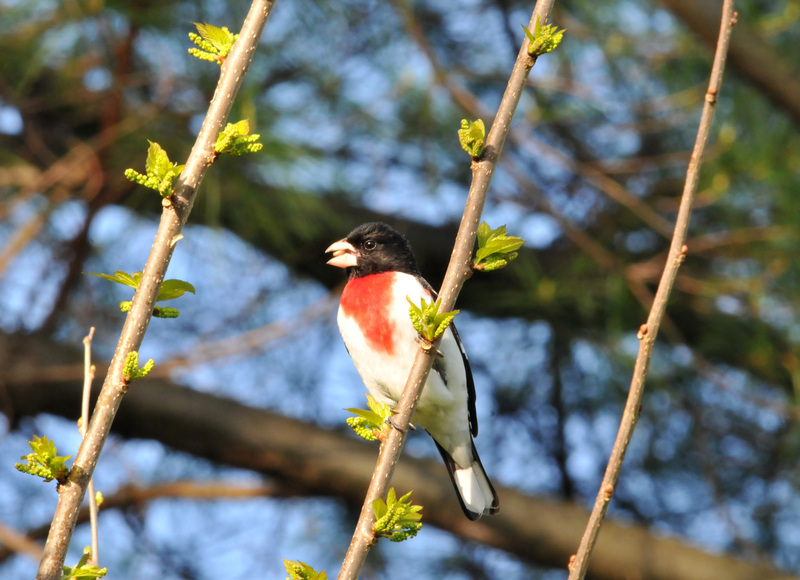 Spring is the busiest time in our own garden aviary. We have both resident aerialists that stay with us year round and the ones that travel back and forth from North to South America annually. Every spring we roll out the red carpet for them, helping them stay strong and nurturing a new generation. By the end of spring some of them already have a new extended family and are ready to start a second brood. Most of them are camera shy but some of them have become used to seeing me in the garden all the time…just another big funny looking deer to them. Male Bluebird with a worm waiting to feed his chicks. This Eastern Bluebird (Sialia sialis) couple had three chicks. Yes, I checked. I patrol the bird houses in the garden to make sure that the House Sparrows (Passer domesticus) haven’t taken them over and to insure the Cowbirds haven’t laid their eggs in one of the nests. This pair ended up with one surviving chick. I witnessed one chick becoming a Bluejay (Cyanocitta cristata) lunch. I have no idea what happened to the other chick so I’m hoping it survived. They just had another brood, four newly hatched chicks, hopefully more than one will survive. 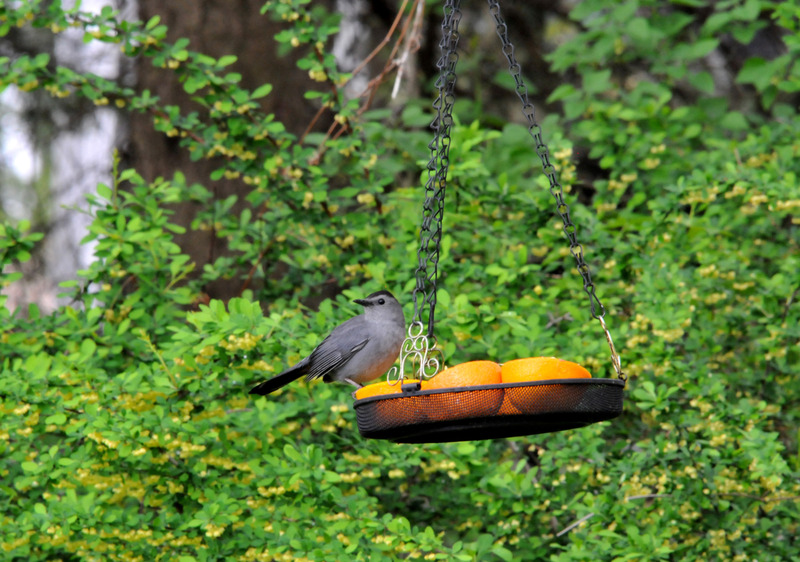 A Gray Catbird tapping the oranges. 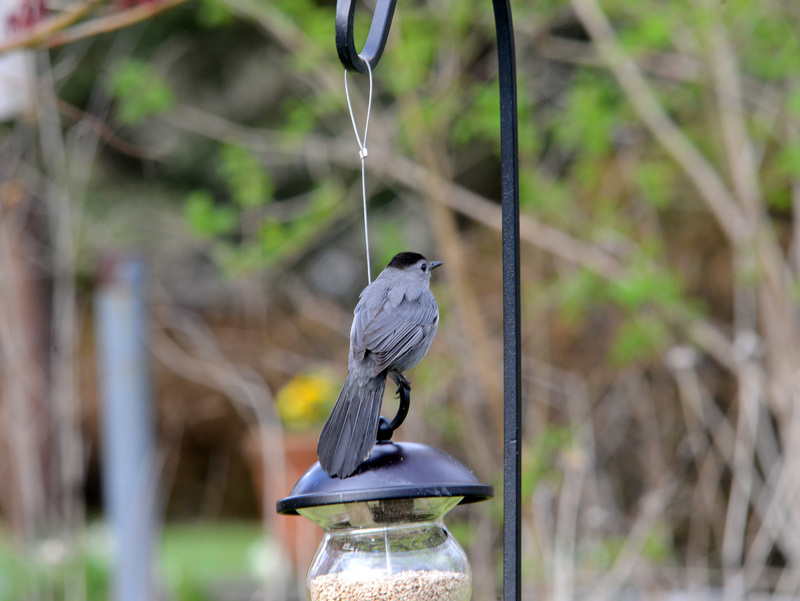 The Gray Catbird (Dumetella carolinensis) is one of the smartest and friendliest birds in our garden. They come back every spring and stay until late fall. We put oranges out as soon as we see the first one show up. They help keep the Japanese beetles under control. Their first brood, two chicks, have grown up and as far as I know one pair has started a nest in the front Forsythia bush. Tree Swallow keeps her eyes on me while I was working nearby and stayed put even when I was a couple feet away. All the books I have read indicated that Tree Swallows (Tachycineta bicolor) produce one brood a year in the Northern US but this pair by the vegetable garden are having a second one. Maybe because their first brood, three chicks in all, and their nest was destroyed by our neighbor’s cat. They didn’t give up and rebuilt the nest in the same box. We put a squirrel guard flange under the nest box this time to prevent the cat from getting to the nest. I haven’t peeked to see how many eggs they have. 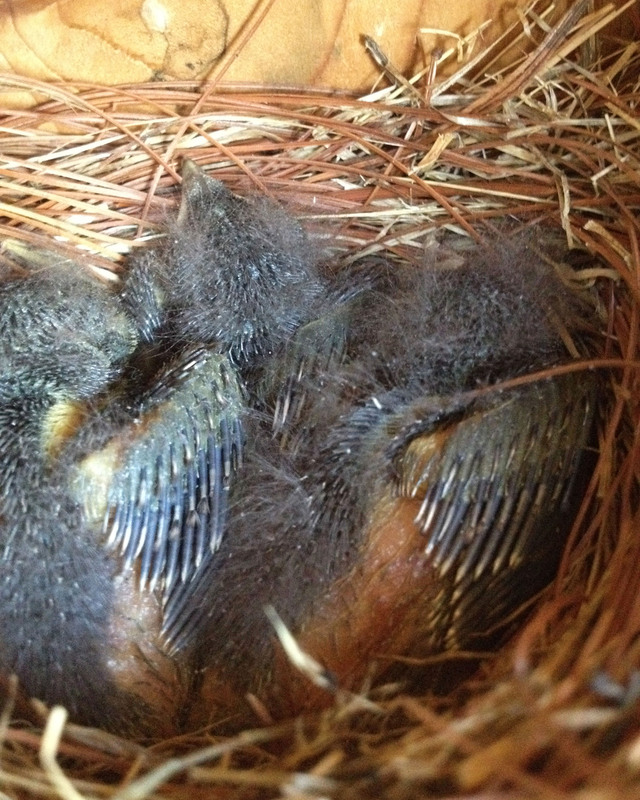 The good news is the Tree Swallow family that nested in the front yard produced five chicks and they have all fledged. With a young chick. Lunch 1st then flying lessons. 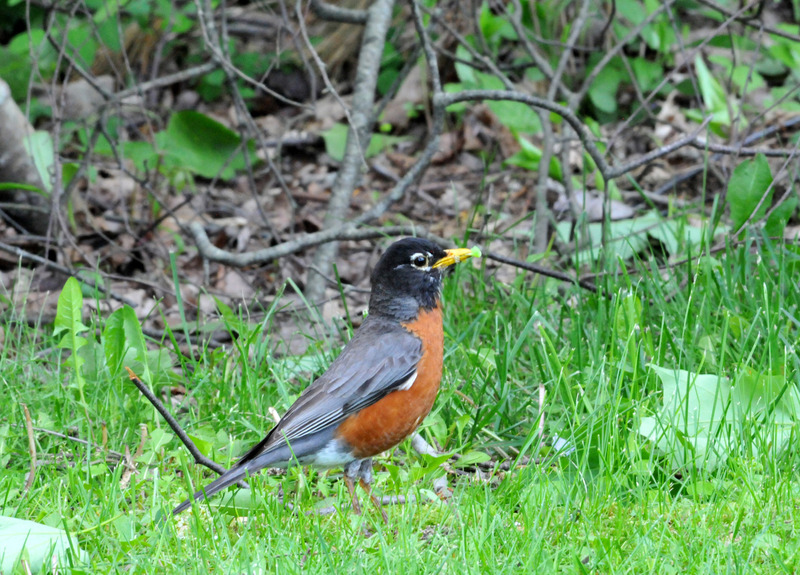 When we see the American Robin (Turdus migratorius) in the neighborhood that means spring is coming. A couple of pairs have nested in our garden each year. They help a lot by picking grubs off the lawn and gardens. Their first brood have all grown up now and they’ve already started a second one. 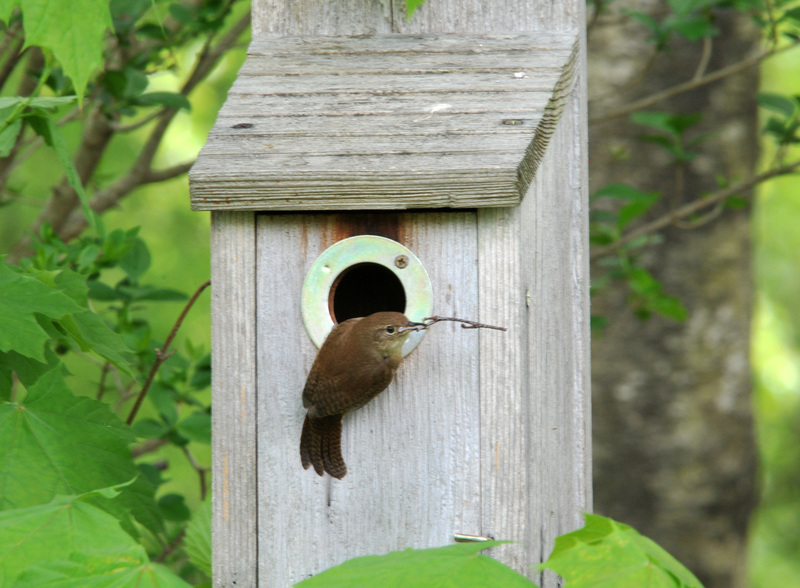 House Wren nest building in late May this year. This House Wren (Troglodytes aedon) was building a nest she ended up nesting in. They have a habit of building a few dummy houses before they actually pick one. 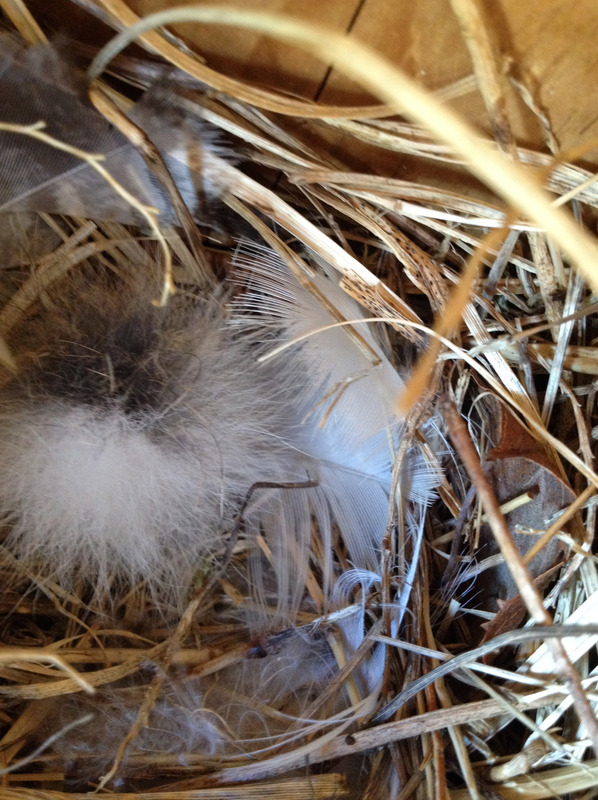 Five chicks from this nest had flown off. Two more pairs are singing and building nest in the garden now. I don’t know where the Ruby-throated Hummingbirds (Archilochus colubris) nest but they are repeat annual visitors and we seem to have more of them every year. It’s fun to watch them doing their courting ritual; flying back and forth sideways like a pendulum- and when they take their dinner at dusk. Delicate and beautiful little birds that they are. 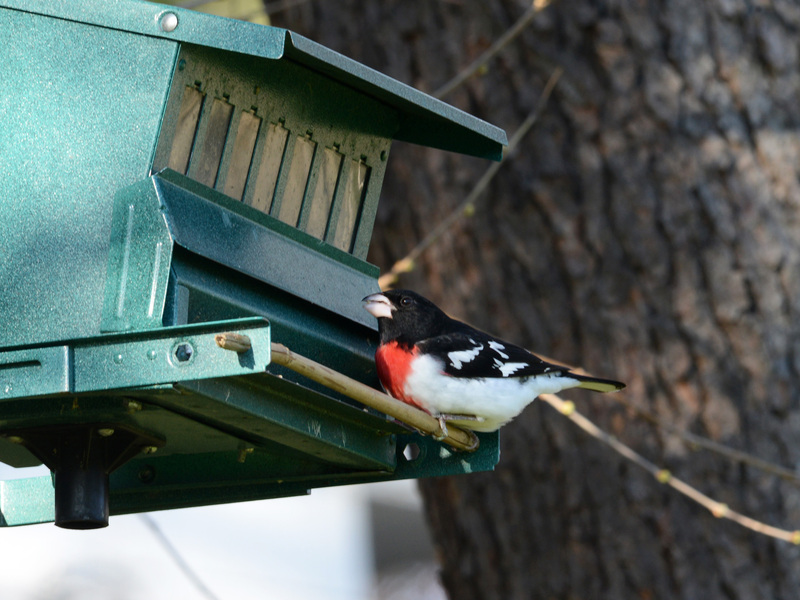 Rose-breasted Grosbeaks (Pheucticus ludovicianus) also stopped by to refuel this spring as usual before flying further north. They have a very distinctive and lovely song. I wish they would nest with us instead of just commuting through. 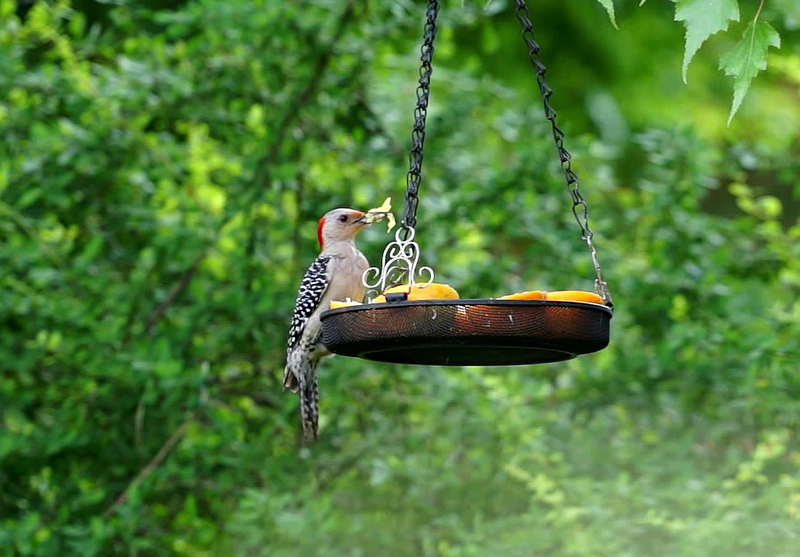 Yes, woodpeckers eats oranges along with a variety of things. They even eat small lizards upon occasion, though there are no lizards here. We were surprised to see one eating oranges we had put out a few years ago. The oranges were intended for the Baltimore Orioles and Gray Catbird but the orioles have never come down for it. 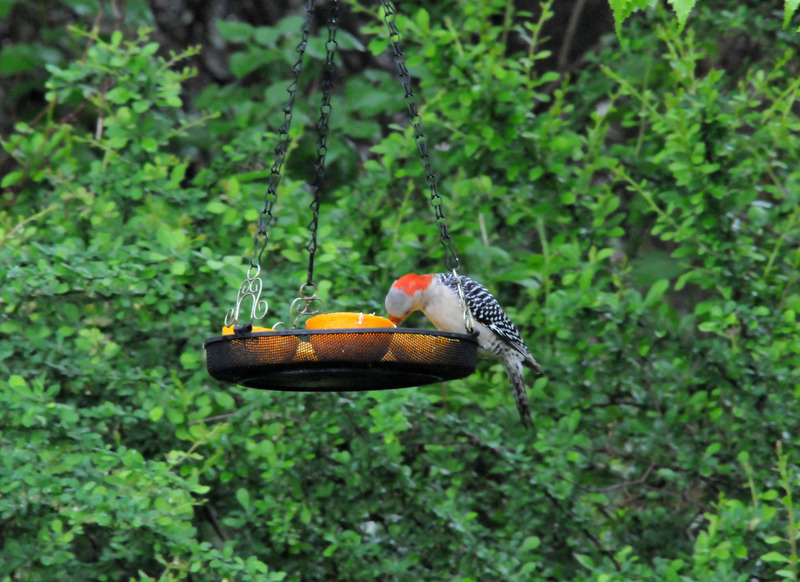 We thought that only one particular Red-bellied was eating them, but more than one stops in regularly when they have active nests in the area. They would eat for a while and at the end they would gather pulp, keep it between their beaks, and fly off, we presume for nesting youngsters. There are some more avians around the garden this spring. The common ones like American Goldfinch, House Finch, American Tree Sparrow, Song Sparrow, Chipping Sparrow, Blue Jay, Red-winged Blackbird, Downey Woodpecker, Chickadee, Titmouse, Northern Cardinal….and with them around we don’t need pesticide. The down side is we see less butterflies due to caterpillars being invited to lunch, so to speak, but our garden is never without someone serenading somewhere in the premises. It’s only the second week of May but five bird families have already settled down in our garden, as far as I can see. 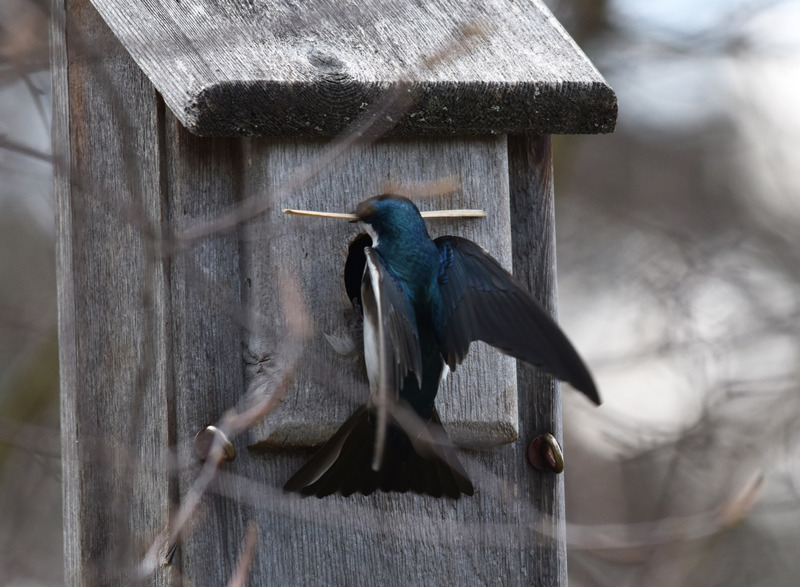 Two pairs of Tree Swallows (Tachycineta bicolor) have decided to build their nests here: one has taken a nest box in the front yard and one at the corner of the vegetable garden. The same spots they nested in last year, actually. 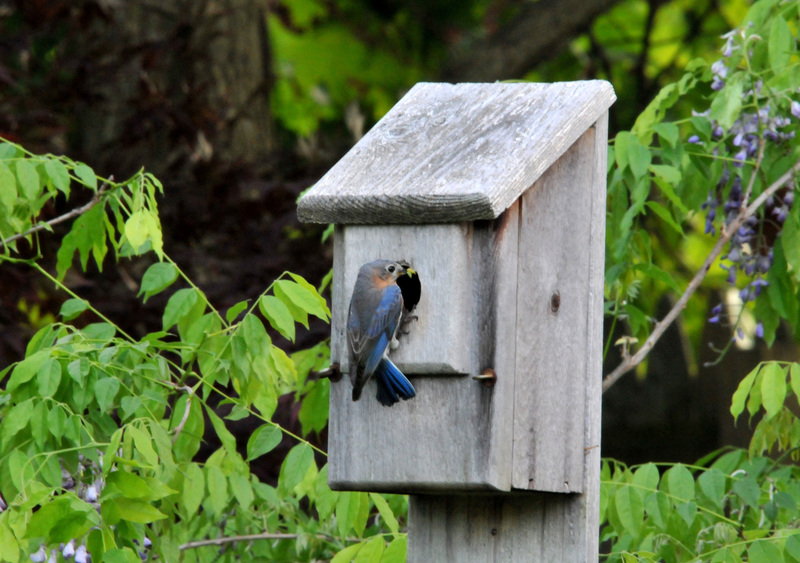 The Eastern Blue Birds (Sialia sialis) have also taken the same nest box as last year. 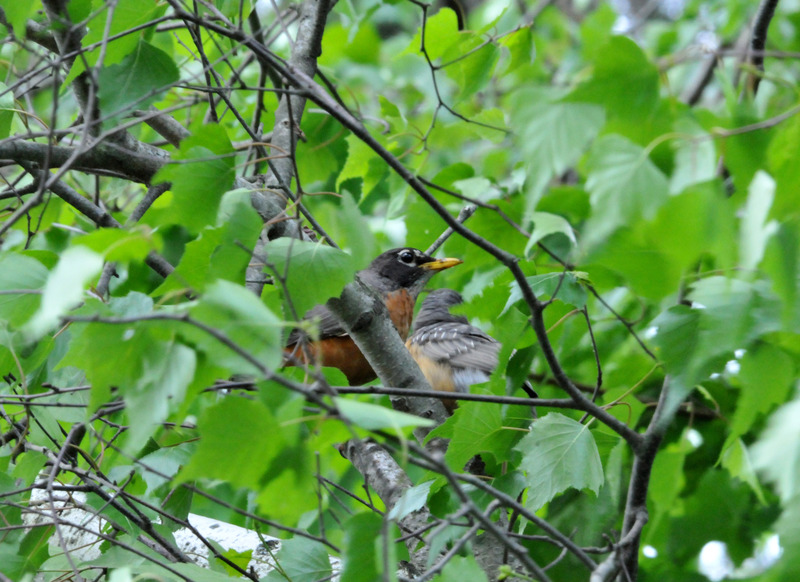 The American Robin (Turdus migratorius) has built their own nest in a Rhododendron. We will have to wait for the chicks to fledge before we can prune the shrub. We can see the female sitting on her eggs from the bay window. The Black-capped Chickadee (Poecile atricapillus) took one of the nest boxes in the front. The Chickadees seem to move around the garden very year. The Barn Swallows (Hirundo rustica) have been checking our patio ceiling for a perfect spot, but we try our best to discourage them. 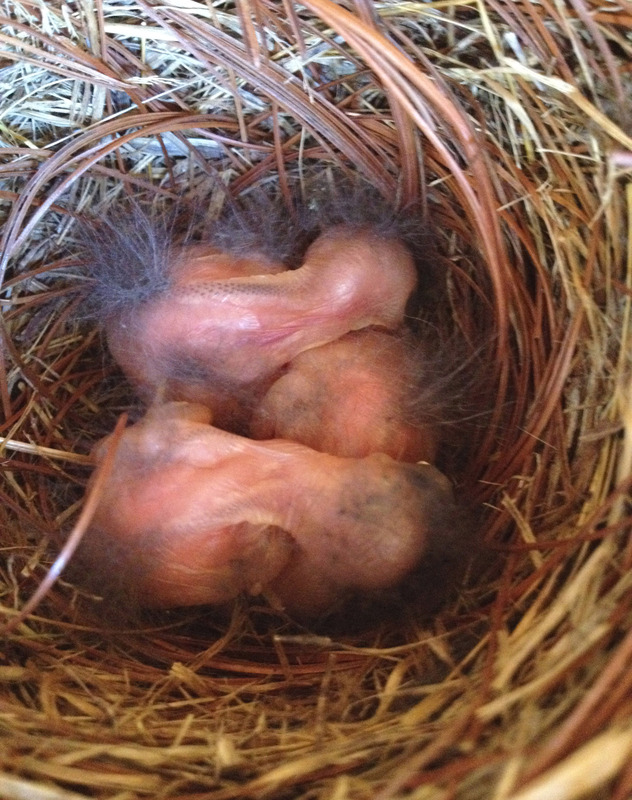 Our experience with the Robins nested there one year, wasn’t pleasant. Those are the ones whose nests I can see. 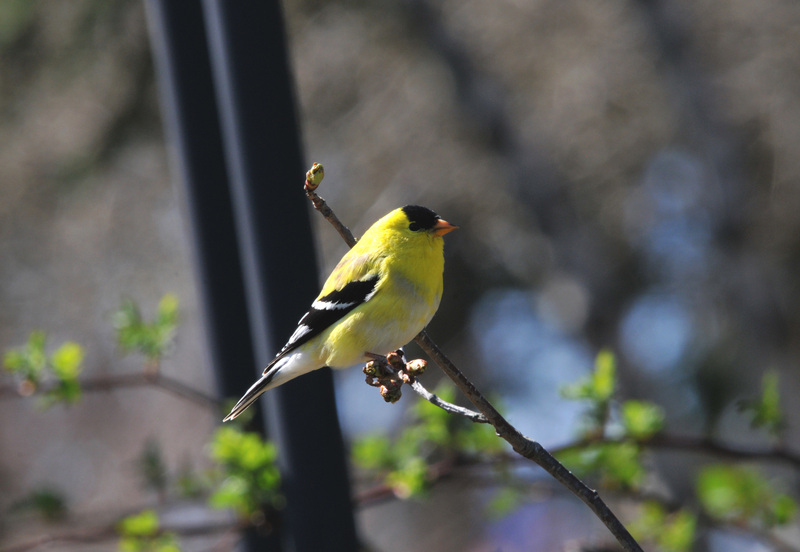 We have plenty of American Goldfinches (Carduelis trisis) who stay with us year round. Most of the males have already shed their winter coats. 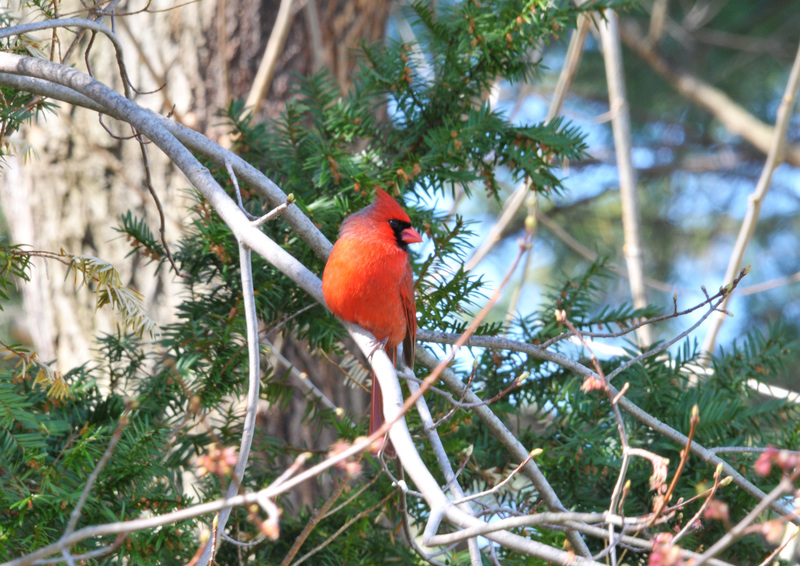 The Northern Cardinals (Cardinalis cardinalis) are still courting and claiming territory. We also have more visitors from the North, Pine Siskin (Carduelis pinus), this year. Not counting the other residents like three or four different kinds of sparrows and woodpeckers, our garden needs air traffic control. This year we also have an infrequent visitor, Eastern Towhee (Pipilo erythrophthalmus). They come around once in a while. At this moment I ‘m waiting for the Columbine to bloom so I can put the Hummingbird feeders up to welcome the Ruby-throated hummingbirds back from Central America. Tree Swallows by the vegetable garden. This male Gold finch still has some grey color left over from winter. A male Cardinal perched but still keeping an eye on the feeder. 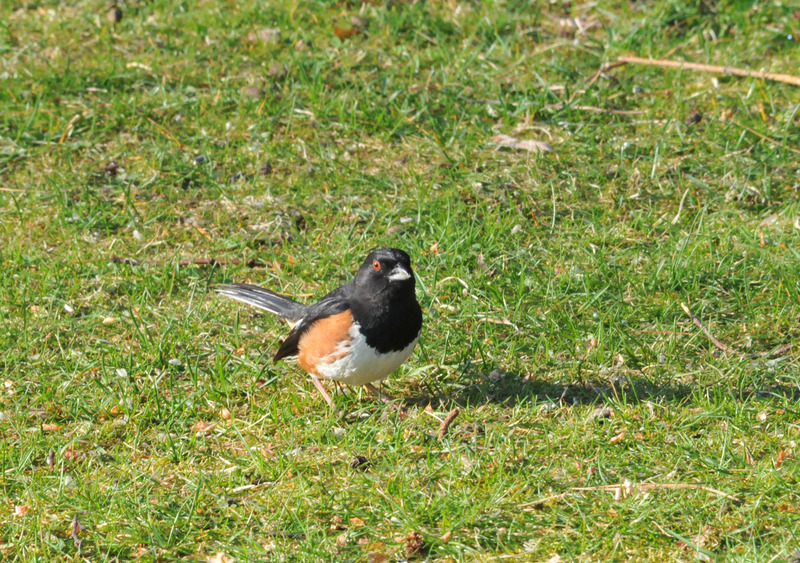 Eastern towhees have been visiting the ground below one of the feeder this year. It’s that time of year again…a time to look for a perfect place to raise a new generation. The birds that usually hang out together during winter start chasing one another, claiming their territory. A few of them checking out the nest boxes we put up in the garden. I cleaned them in mid-fall and put them back up for the birds to roost in winter, and I check them again around this time of year to see if any of them need to be cleaned again. Some birds do make a mess in there when they use them as a roosting place. The Eastern Bluebirds (Sialia sialis), which never left us this winter, have been coming everyday to check the nest boxes. They seem to be very serious about two of the boxes. 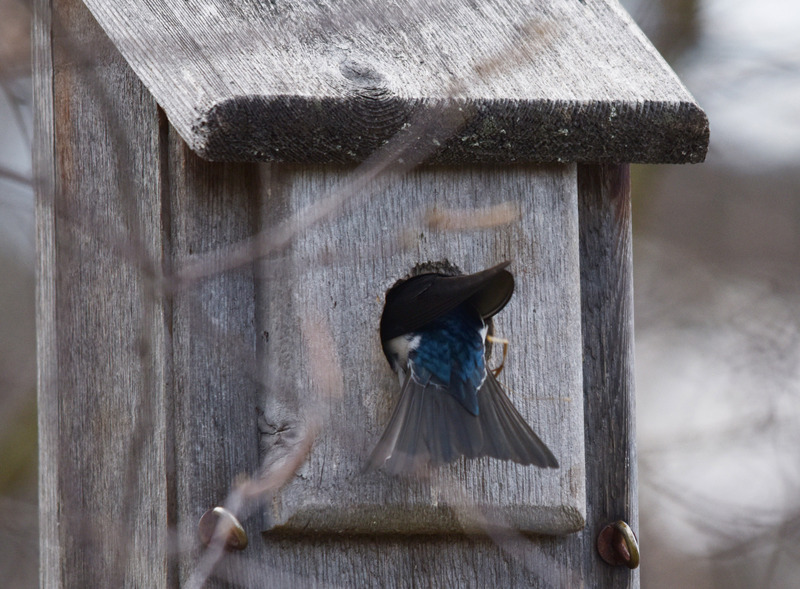 One box had a pair of Bluebirds nested in it last year, and a pair of Tree Swallows have nested in the other one. 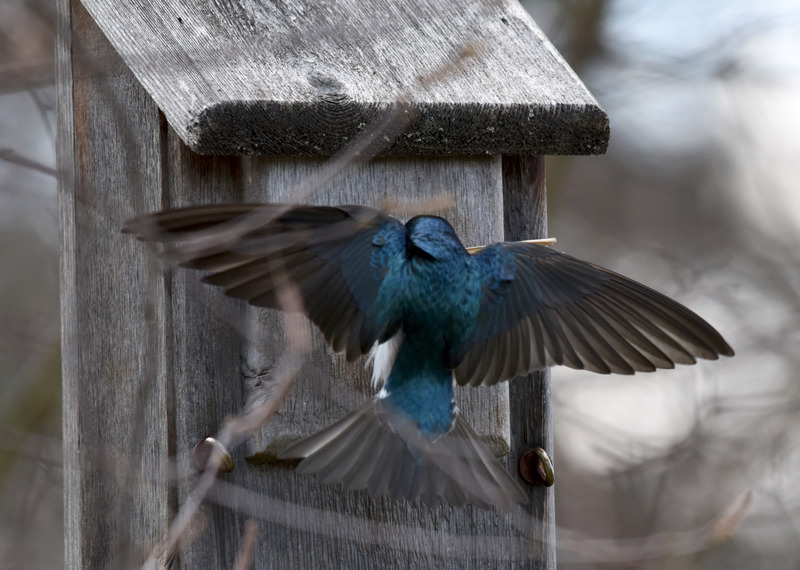 I hope they make up their mind soon, especially if they want to take the one that the Tree Swallows used to nest in. 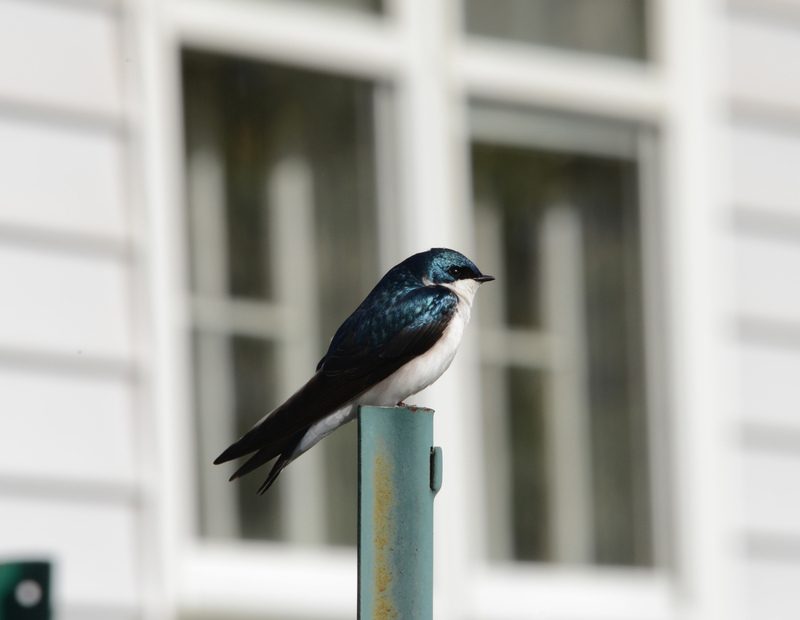 Tree Swallows (Tachycineta bicolor) are known to come back to the specific nesting place they used in the previous year. We had two generations, three pairs of them nested in our garden last year. And, yes, the older pair came back to the exact nest box they had used the year before. They are pretty vicious in defending their nest so I hope the Bluebirds will build their nest before the Swallows come back. We love both of them so we can’t really take sides. With House Sparrows (Passer domesticus) and European Starrings (Sturnus vulgaris), we pretty much chase them away or clean them out if they have nested in one of the boxes. I know it sounds mean spirited but they are pests and they kill other birds or break their eggs to get their nesting place. They’re not indigenous to this area. I would also like to increase our state bird population. 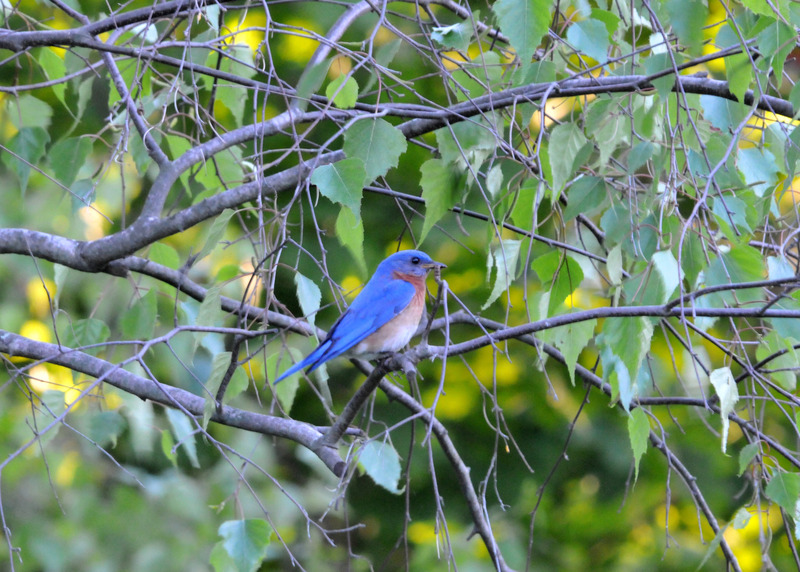 The Bluebird is the official New York state bird. I acquired this knowledge a few years ago when I looked up Bluebird so I’m glad that we’ve hosted our state bird three years in a row…..and hope to continue the trend this year. A male Bluebird checking one of his two favorites. 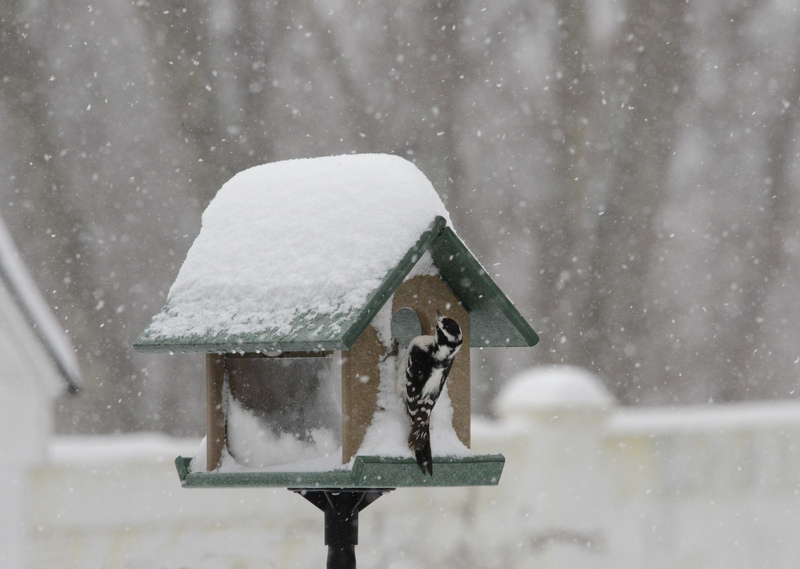 A female Downey Woodpecker checking a Bluebird feeder during the last snow storm. The Downey and Carolina Wrens have learned how to feed in there.